Obviously, if you don’t agree that home canning milk is safe, then don’t do it. This isn’t something that everyone feels safe with, and as always, use your judgment on this!!!! Hmmmm…well, if you are only able to get groceries once a month like I am, buying several gallons of milk makes sense. BUT, trying to store the milk in the fridge and freezer is very space constraining. So, being that I use a lot of milk for cooking, I decided to try and can some. And you know what? It works! The flavor doesn’t change, and the texture is just fine! We use it to cook, and if I need some for granola or drinking, I chill it well before opening. The following tutorial is based on my research, and what I felt was the best method for doing this. Is pressure canning milk safe? Well, the jury appears to be “out” on that. For many, it’s not safe to can milk at home. According to Clemson University, it’s not safe to do it at home. However, many homesteaders, preppers, and home canners disagree. As always, please use your own best discretion and if you don’t think it’s safe, don’t do it. Here’s how I can milk! First, you are going to start off with well-washed jars. I used pints because it was much easier to work with in terms of storage, and usage. My hubby even knows one-pint jar for a batch of mashed potatoes. 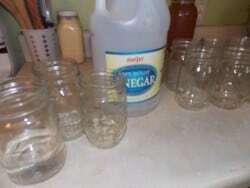 I then rinsed the jars out with vinegar to sanitize them. I didn’t want any water in there, nor did I want the jars hot, so this was what I came up with. 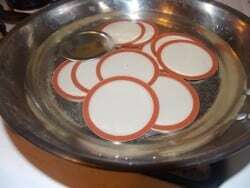 I then rinsed them out to get rid of the vinegar and placed upside down on a towel to dry. Then, I got the lids simmering…this softens up the seal and gets the lid ready to can. Muy importante! I then poured the milk into clean, rinsed jars. Yes, this milk was cold, so that’s why I didn’t want to have hot jars. Wiped off the rim, added the lid and band, and screwed on finger tight. Waited until steam vented, and then let the steam vent for 10 minutes. This part took about 35 minutes to get to, then the 10 minutes=45 minutes of waiting time total. Added the rocker for 10lbs pressure. As soon as the rocker began to rock, or the pressure was 10lbs., I IMMEDIATELY turned off the heat, and let the canner cool. Removed the jars, wiped off, and voila! Canned milk! 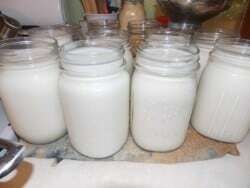 Pressure canning milk may be an option for you in certain situations. Do your research and make an informed choice. Hi, thank you for this post. How long should it be shelf-stable? Thanks! From my research, the average shelf stable time is 18-24 months. I would plan on using this up before 18 months, just to be on the safer side of quality. I used this method a couple of years ago. One thing to note is the lighter the fat content (I experimented) the less ‘cooked’ the milk tastes after. I used 1% and it came out like light evaporated milk. Stored the jars in a cool, dark basement. Now for the down side. It kept nicely for six months. After that it starts to separate. After a year it’s not pleasant anymore, though it kept its vacuum and smelled ok. The USDA does not recommend home canning dairy products, though my butter and ghee is fine. I will not be canning milk anymore, though. It’s easier and better tasting to use a good brand of powdered milk (I recommend Saco, when you can find it) prepared with COLD water. Carnation is ok, but Saco is better. Same thing happened to me Mrs Wagner, all was good for a yr and it got lumps. But seals were all good. I guess I’ll just store powder milk from now on. It’s about the future for me and not the now. Did you can store bought or raw milk? Hello, I am going to try this, makes sense for my situation. I am a single widow who loves to cook. I get tired of buying milk only to have it spoil before I can use it up. I can buy a gallon of milk, can in pints, and use as necessary without the milk spoiling before I use it up. Has to be the best canning idea I have seen yet. One thing you can do to extend your store-bought milk is to add a pinch of salt when you open the bottle. The salt [the original preservative] stops the bacteria turning it sour for at least a week. I’ve been doing this for many years. A pinch is too little amount to taste. where do you store it and how? the canned milk is just stored in the jars it’s canned it, on a shelf in a cool, dark place. To use, I just stick some in the fridge the night before to chill. I appreciate your stopping by and bringing other research to the table! I have often come across a statement made by the USDA ore others that milk is not safe to can. However, they have never produced any scientific proof of such. I think the USDA makes a negative statement regarding some foods, because there may be too much room for human error. Most canned items are processed for up to 90 minutes and that keeps the USDA happy. With milk, the processing time is 1-10 minutes, depending on the amount of caramelization desired. I believe the USDA has a problem with giving the okay to such a low process time. I have canned store bought whole milk in increments of 1-10 minutes, depending on the caramelization effect that I want. The 10 minute processed milk tastes excellent in coffee and cooked cereals. The 1 minute preocessed milk is good for cold cereals. My canned milk has kept for 2 years in my dark, cool pantry without any change in appearance or taste. without being there, I am honestly unable to answer you correctly…usually the fat content shouldn’t matter, though. Perhaps you left vinegar in the jar and it curdled the milk as it was processing? I am sorry that this happened! Well I do a little different method I start the same then vent for 10mins then at 10lbs of pressure for 20 mins n it’s stayed shelf stable for 6m it would probably b good a bit longer but it’s used up by then hope this helps those that mennchened it going bad my option it’s cause it’s not left to pressure long anuff but like she said this isn’t something they recoment my granny did this it will b more like a carnation type milk tho where it’s cooked at a longer periods. this was done according to the research I did…to process it any longer, the milk would curdle. this was what I considered the “best” of all the processes and times out there. You’re right Heather! This process keeps the milk “drink-able”. Iv used it on store bought milk and raw goats milk. Usually at the 6 months mark it starts to discolor and maybe clump a little. I can’t wait to try cream in small jars for coffee. …..thanks! How much water did you add to the pressure caner? I have canned, milk, cream 1/2 & 1/2, goat milk & butter for years…I am 55 and still kicking, my grandmother’s who taught me passed on in their 80″s. I do sterilize my jars in the oven for 30 minutes then shut the oven off leaving the door closed until they cool. I did not have luck with the vinegar method. I DO use RAW milk from our local dairies (store bought has REALLY been cooked with additives and then cooled). I completely remove canner from the heat. Other than that I do the same method as Heather. I am glad you posted that. Of course my Grannies didn’t have access to any professionals or the internet to find out what they could and couldn’t can they were canning for survival. Their motto was I like it…I can it! Now mine ( I am “modern” is if you can buy it you can can it & if I like it I can it! I am glad they survived or I wouldn’t be here! Good job Heather keep posting & canning. It is a great life skill to have :)! thanks for stopping by! Appreciate your comments! I miss my Grannies, I learned so much from them! I was wondering about canning cream. Good to see you have been successful. 😉♥️ I too learned to can from my elders. So glad to see this stuff out there for the young generation! I am so glad others use time feasted canning by their grannies. I come from a long line of scanners and my mother who is 78 still cans to this day and we share great memories canning together. Thanks for sharing. I have a dial gage. After I have let it vent, hold at 10 lbs of pressure, how long should I let it go for? Thanks in advance. I had to also JUST found me a supply of raw goats milk! so excited to find this “reluctant granny” and “heather” thank you! CANNER UNDER HEAT TOO LONG. NOT SURE. GOING TO TRY YOUR WAY WHEN MY GOATS KID. I WOULD BE USING FRESH RAW GOATS MILK. THANK YOU FOR POSTING THIS. I ALWAYS HAVE FROZEN OUR EXTRA MILK WHEN NOT MAKING CHEESE OR ICE CREAM WITH IT. BUT TAKES UP FREEZER SPACE I NEED. 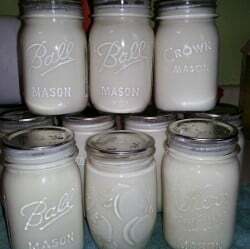 I have been canning milk for a long time and it is really easy I use whole milk and I do the normal prep with jars however because the milk is cold my jars are cold but my lids are hot to soften rim and they go into cold water pressure canner then water heats with jars 10 lbs of pressure bring to pressure and time for 5 mins tops remove from heat and let canner cool, does not get a Carmel color comes out right every time and have never lost a jar yet. Does the milk taste fresh after its refrigerated ? Could it be used on cereal or drank ? Do you think you could make evaporated milk and can it the same way? I honestly have never tried…if you do, though, please be sure and share it with us! If my canner has a dial pressure gauge rather than a rocker, should I turn off the heat as soon as the gauge reads 10lbs pressure? About how long does the milk last canned this way? I honestly have it used up within 3 months…I have read anywhere from 3-15 months storage life, but I personally would use it within 3 months. I process mine a bit longer than you. Because it’s a protein and liquid, I treat it like broth. So 20 minutes at 10 PSI. It caramelizes a little, but it still works just fine everywhere. Anyway, with that in mind, I have traveled cross-country with jars of milk in a U-haul truck, and I’ve stored them for over a year without an issue. that is so good to know that you’ve used milk stored that long! thanks Marie! I know this might sound stupid but where do you store your milk once it is canned? What kind of milk are you canning? Raw, pasturized, ultra pasturized? What I used here was raw goat’s milk because that’s what I had. I have seen it done with pasteurized as well, though. goat, cow or whatever I have…raw or pasturized. I have used this for all, depending on the season and what I have available to me. I’d like to know if you have made evaporated milk and then pressure canned it for storage. I’m going to make evaporated milk but I’d like to know if I can make a large batch and “put it up”. I use evaporated milk everyday in my coffee. I had a light bulb moment and read the back of the can…duh? I do not want to ingest this anymore. I haven’t tried evaporated milk…but that sounds like a great idea to work on! I am sure this would work great for making things like yogurt (where the milk is heated anyway), but does it taste good for things like cold cereal? I love the idea of saving freezer space! 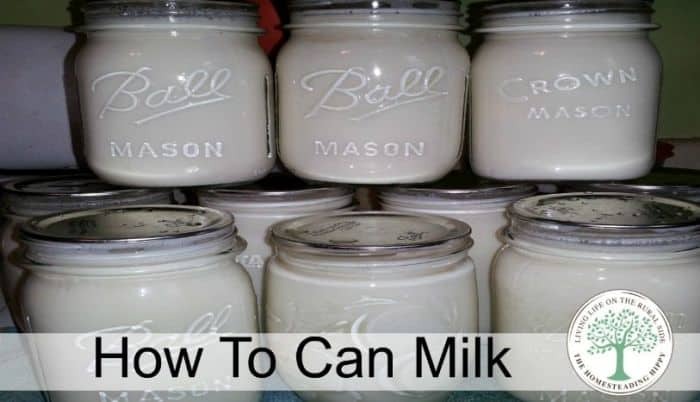 Do you leave the cream in the milk or take off top before canning? With the goat or pasteurized milk, leave it…with raw milk, I skim the cream. But that’s only because I use it to make butter. Does this not work with a non-pressurized canner? I would love to do this since I can get raw locally, but can NEVER use it all before it gets old. I *personally* wouldn’t do that, since it’s low acid, you need the pressure. However, you can freeze it, make cheese, kefir or ice cream with it as well 😉 And raw soured milk is awesome for biscuits, or sour milk cakes! No. Pressure canning is ABSOLUTELY required if you’re canning something with a non-acidic pH or that has low salt/sugar (solute) concentration. Do NOT can milk in a water bath canner. What great news this is! Thank you All! Actually, the Amish can with a water bath canner for everything, including meat. It’s just more difficult because you have to maintain a steady temperature for twice the amount of time. For instance, when they can meat, they process for 3 hours instead of 90 minutes. Pressure canning is shorter and it’s easier to maintain the high level of heat. I know they do! Crazy, because it’s really not safe to do that AND it takes so much longer! I spent 10 years in Bulgaria where theyve never heard of a pressure canner and EVERYTHING is canned in a water bath.They do have the advantage of having done it for generations and recipes are just ingrained in their blood.I learnt how to can food there with some amazing old ladies.We canned 2 fully grown pigs,every bit of them went into jars and was boiled for 3 hours.That was 2 years ago,i still have 1 jar left as i brought the jars with me when i moved back to ireland.Research hhas to say its unsafe as we dont have the knowledge of these old ways and if someone said it was safe and some fool did it wrong and got food poisening then there would be a law suit. that said,i bought a pressure canner from US,as it is much faster and uses less fuel.i loved your article.ive been canning my goats milk and i have just ordered a separator and i am wondering if i can put the canned milk through the separator and get cream from it.i only have 1 goat so it didnt seem viable with a small amount of milk,il let you know how it goes. Please do let me know I have 4 goats. We have a vacation home where we just need only small amounts of milk for a short amount of time. It is most convenient to buy evaporated milk and mix with equal part water. Recently our last child moved out of our home and I am considering doing that at home as well. Tastes good with no waste. Hey. I love your post. Thank-you. I’m just starting to learn how to can. I have a question about something different. Canning Pumpkin purée. I’ve read that you can’t. But then people say their granny’s have been doing it for years! But no posts about how to do it. …. can someone help? I have no room for freezing it. But want to use really pumpkins in stuff all year long. [email protected]. Thanks. I have honestly never canned pumpkin puree before. I have always done it in chunks, then pureed as needed. Huh! Didn’t know you couldn’t do this! I can mine as a purée I think 90 min at 10#. I bake pumpkin first, removes skin and purée in blender. It’s been awhile since I’ve canned pumpkin. I used to do shorter and always spoiled most of it but this works fine for me. Keep time? At least 6 months. Usually used it all by then. It is not safe to can pumpkin puree, even in a pressure canner. It is too thick when pureed to heat evenly all the way through and is therefore susceptible to botulism. You can can cubed pumpkin or you can freeze pureed pumpkin. I personally would not can milk either as most modern research concludes it is not safe to can dairy products. Same in Costa Rica plenty of eggs and Dairy for sale in tropical room temps. No AC in the open air stores. None of us got sick. Heather could you please tell me what your headspace is for canning milk? Heather, I canned milk about a year ago, and like one comment above, mine turned a caramel color. It tastes fine and I use it with cooking … I just tell my husband it’s the vanilla in the recipe that turns it brownish! Not sure I could get him to drink it. Do you think I canned it too long? I can’t remember how I did it, but I will say, a year later, it still tastes just fine. I don’t think so. From what i understand, it does change color a bit over time. I haven’t ever kept it more than 3-6 months, but many other bloggers have it for a year, and say the caramel color is normal. I have heard a lot of negative advice about how unsafe it is to can dairy products such as milk, but i was always under the impression they were talking about fresh milk straight from the cow not already pasteurized milk do you know which they are speaking of. I have heard many people speak positively about canning milk, and butter buy when it’s cheap and can it. The recommendation elsewhere is 20-25 min for a quarter at 10psi. That does carmelize a little bit which gives the color. Supposedly that lasts more than a year. This may have something to do with the fat content as using 1-2% is supposed to reduce the evaporated taste and color. One of the posters above says 5 mins at 10psi is ok and doesn’t carmelize, and the original article removes heat after it reaches 10psi. Sounds like these lower temps don’t last as long in storage. Milk can be pressured canned, it’s how we did it before commercialized dairy’s came along. It’s in the older canning books. Treat it as a low acid meat/protein. This article was awesome! I didn’t realize you could can milk. Just never thought about it. This would make camping or other storage so easy. Wouldn’t need a big icebox. Just put it in pints or size jar per use. Please reread over the instructions. For some reason it seems the part where you load the canner, put the lid on, bring the canner up to temperature, or whatever, seems to be misding. I assume it’s just like raw packing meat, but I’d like to know definitely. How long will the milk last in the fridge once the jar is open? I would use it up within 2 days once opened. I was wondering what the difference is between canning milk and the shelf-stable milk in cartons like Parmalat (sp?)? 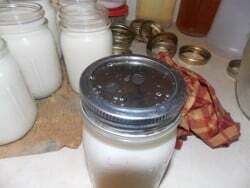 If milk can be preserved safely that way, why not canning? I’ve read a lot of the comments… and I know this is a bit off topic but I have been wanting to make homemade caramel sauce forever and can it, but there are no recipes for it do to the fact that its deemed unsafe. I’m now convinced more than ever that it can be done. I’ve also heard a few times that you can somehow use a little baking soda which is supposed to balance the ph levels??? Do you or anyone reading this know how to can caramel sauce? I understand it’s not recommended, but I would be very grateful for any insight. Thanks for posting this! Have you ever tried raw milk? Do you think it would be safe to bottle raw milk? Holly, I would first pasteurize the raw milk. Simply put, I would put it in a big pot and bring the temp up to 185. 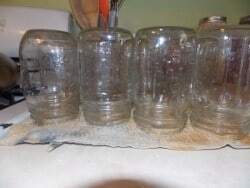 Then, dip/pour it into the sterilized hot jars, place lids and rings on the jars and put the hot jars of milk into a pressure canner with hot water in the bottom of it. Secure the pressure canner lid and follow canning guidelines. I offer my suggestion to pasteurize, as a safety measure. If you find that pasteurization is unnecessary, then, do as you think is better. Any body tried freeze drying milk ? Just spent an hour reading in here. I’ve been canning bath & pressure, for 40 yrs. Only two jars failed. I’ve never done dairy/meat/fish because of all The Warnings! 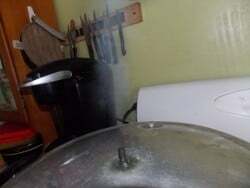 Some pathogens, bacteria, and parasites can survive a 212F boiling bath, regardless of how long you boil it. But, hanggggg onnnn! As long as we cook flesh to the recommended temperature, (165F…185F, depending), it’s okay to eat it at the table tonight? Huh? Lightbulb moment – this seems illogical. I’ve pressure canned meat stuff Properly*, and always found it results in useless mush. Yuck! Can anyone solve my newfound conundrum. …hot enough to eat/but not hot enough to can?? Hmm. 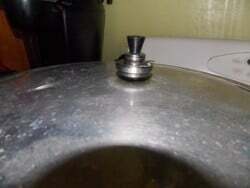 Can you use the boil canning method since it’s not acidic? Like caning jellies and jams? What about fresh cows milk from your own cow?